This is a special request recipe. Combine the fresh yeast with sugar, 2tbsp of flour and 125ml of milk and mix well in order to remove all lumps. Cover with a damp cloth and set aside in a warm place to begin to rise for 15-20 minutes. Gently melt the butter and combine with the eggs and whisk. Into a large bowl put 300g of flour, the lightly beaten egg/butter mix, a pinch of salt as well as the starter dough and start to combine to form a ball of dough. Knead the dough in the bowl until it doesn’t stick to the sides of the bowl. Form a nice ball, cover with a damp cloth and set aside in a warm place for around 1 hour to rise. Whilst the dough is raising this is the perfect time to prepare the stuffing. Chop the onions into small pieces and fry slightly in some butter on a low heat. Do not let them change colour we just want to soften them. Grate the cheese. 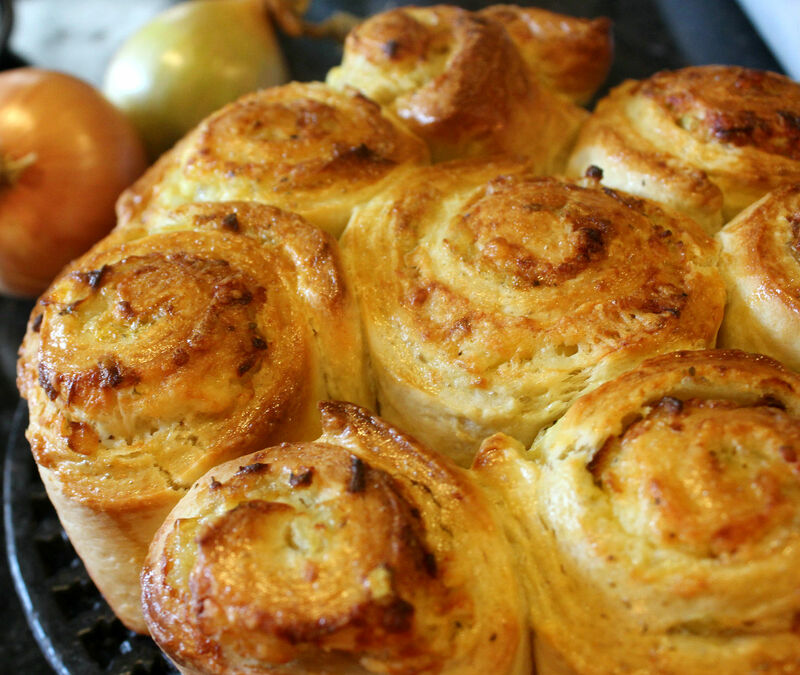 The cheese will define flavour of your rolls so pick something you like and enjoy. We went for a lovely Swedish cheese from Västerbottensost. Chop the herbs if you are using fresh ones. Go make a cup of tea and relax for a while. When the dough has doubled in size remove from the bowl and place on a lightly dusted surface and work it a little with your hands. When ready roll out to achieve a thin flat base, ideally in the shape of a rectangular. 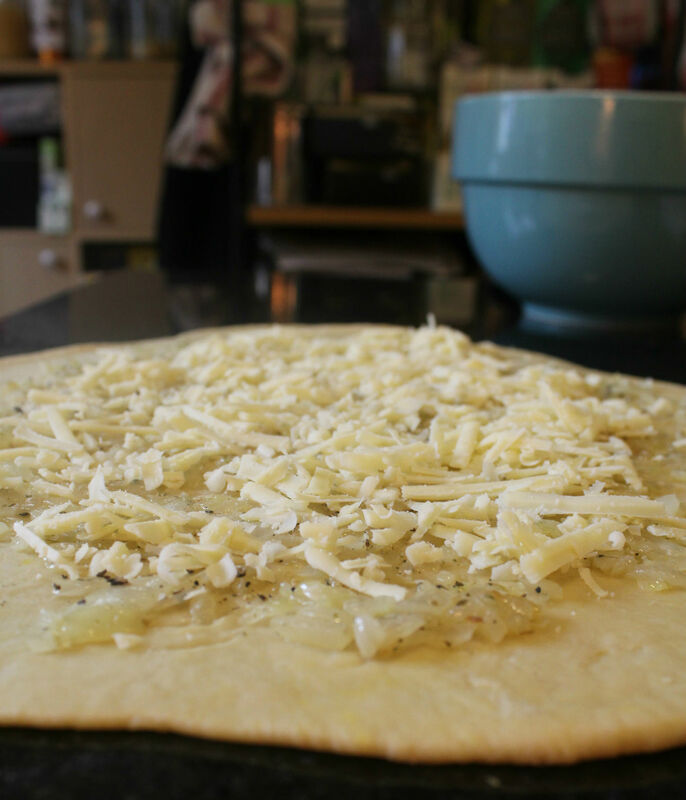 Spread your onions evenly on top of the dough and then sprinkle with grated cheese. Add spices/herbs to taste but be very careful with the salt. If your cheese is quite strong tasting I would advice to skip the salt all together. Now you need to roll everything up into a log. Starting with the long side, use a palette knife to raise the edge so you can grab it. 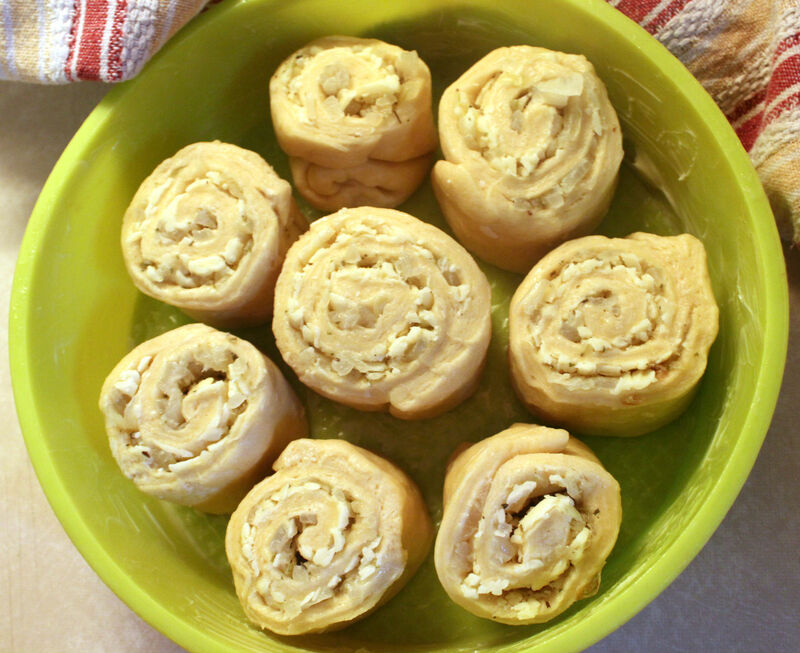 Fold it over on top and then with flat hands gently roll it all up. With a sharp knife cut the log into small slices roughly a couple of cm wide and place into a baking frame. Again cover with a damp cloth and set aside to rise for another 15-20 minutes. Paint all the tops with some egg wash and bake in the middle of the oven you preheated earlier to 180C, for 30-35 minutes or until golden brown. Next > Baby #ootd – Beige or Blue? They are making me hungry – so delicious looking. These look ridiculously good. So much yumminess!! I love the sound of these. I think they’d be a big hit with the kiddies too. ooh they sound wonderful, just my sort of a breakfast! Mmm… these look delish! Not very diet friendly for me, but looks tempting! These would also be fab for buffets don’t you think? Thanks Paul for making Agata publish this! Oh, I bet these taste delish! It’s the perfect thing to prep the night before and bake fresh in the morning! 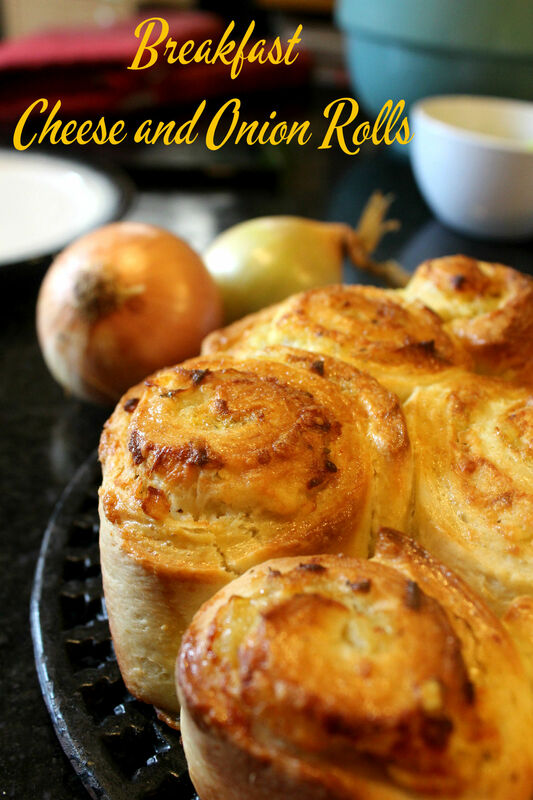 Whilst I am not a fan of cheese and onion flavoured stuff, I must say these do look lovely.